Minor point: L can only be considered constant over a narrow temperature range. It does vary with temperature. See for example here. Yes, I've calculated derivatives at 300K only. If you want to track over a big change, these need to be integrated, including variable L.
still used. Your basic conclusion is correct of course: there are competing effects of latent heat (that acts to warm the air and increase the volume) and condensation (which acts to decrease the volume). 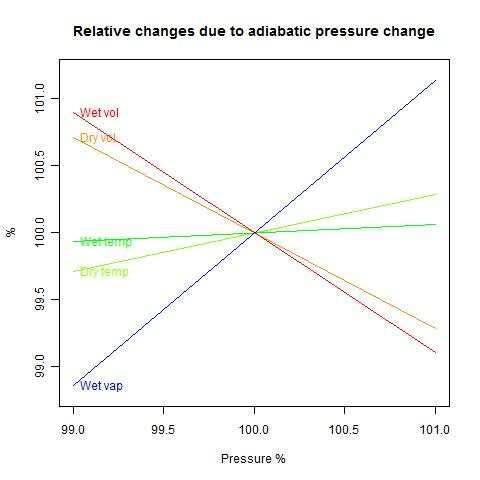 Latent heat is dominant, so the moist adiabatic lapse rate is slower than the dry rate. Yes, I appreciate that you have done a full cycle analysis, which is necessary for analysing an engine. Here I'm just trying to demonstrate the dominance of the latent heat. As I said at the Air Vent, I think your engine is a very good demonstration of this, on the evaporation side rather than condensation. I commented on Lucia's blog basically the same point as you stated. The condensation releases 540 cal/g of removed water and the water vapor volume loss gives a much smaller total volume loss than the air heated by this excess energy gives an increase in volume. I used a 1% by weight water vapor content and showed it gave a net 6% volume increase. Lucia came back with some irrelevant comment, and the blog comments went on ignoring this simple fact. Obviously the cooling from adiabatic expansion when rising is the basic cause, and the dew point drops faster than the pressure, so at some point the water vapor condenses out. Yes, a lot of people have found a LH/mass factor of about 6. Dr Rosenfeld, in his review of an earlier AM paper, estimated (S12437) 223/40=5.6. Jim D got about 5.7. The latent heat is released. It won't just vanish.